A few hashtags to describe a green smoothie! 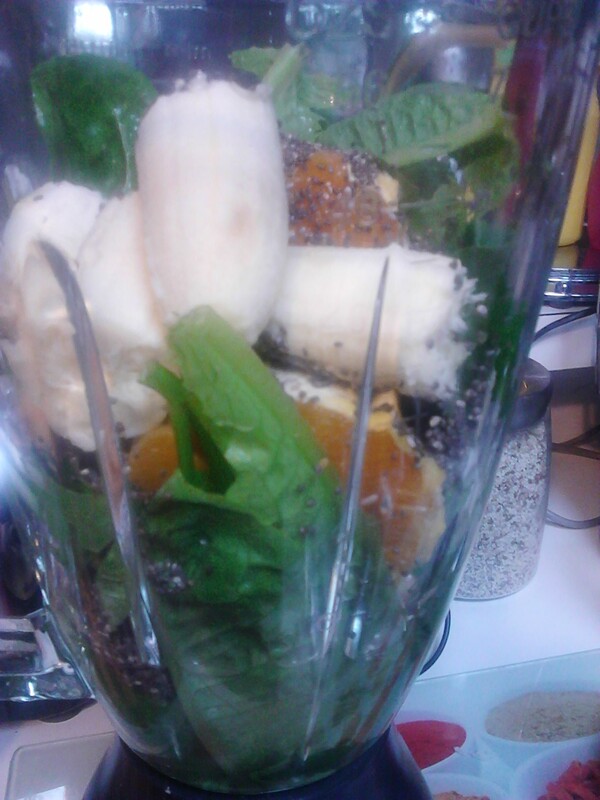 Mental and practical roadblocks people use to not have a green smoothie in their life. Do any of these sound familiar? They can all be overcome if you can think out side of your comfort zone. If you don’t have a blender they can be purchased very cheaply or you can borrow one, and if you grow your own green leafy vegetables that is another one crossed off the list. Take the plunge and try a simple recipe for your first smoothie that is guaranteed to be delicious. You can even leave the chia seeds out. Cos lettuce (fill up half the blender with this, but make sure it is well washed), one small banana, one navel orange, 1 tablespoon chia seeds (optional), some fresh mint and enough plain coconut water to give a good consistency to drink or you can eat it with a spoon. 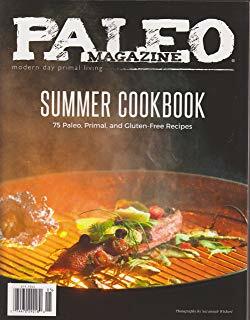 Just pile all of the ingredients into the blender and process. Pour it into a glass and enjoy! An amazing colour with a wonderful sweet flavour. A green smoothie is different to a green juice. A juice has most of the fibre removed and is much lighter to drink and digest. When l was very unwell last year l loved having a green juice as the nutrients were quickly and easily broken down and absorbed for use in the body, whereas a smoothie was too heavy for me and l just couldn’t digest them. 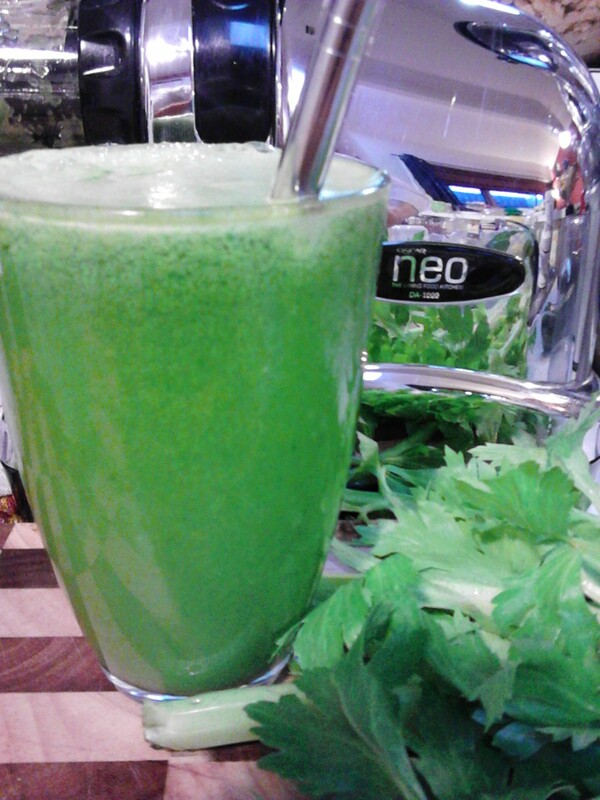 A green juice made with the Cold Pressed juicer. 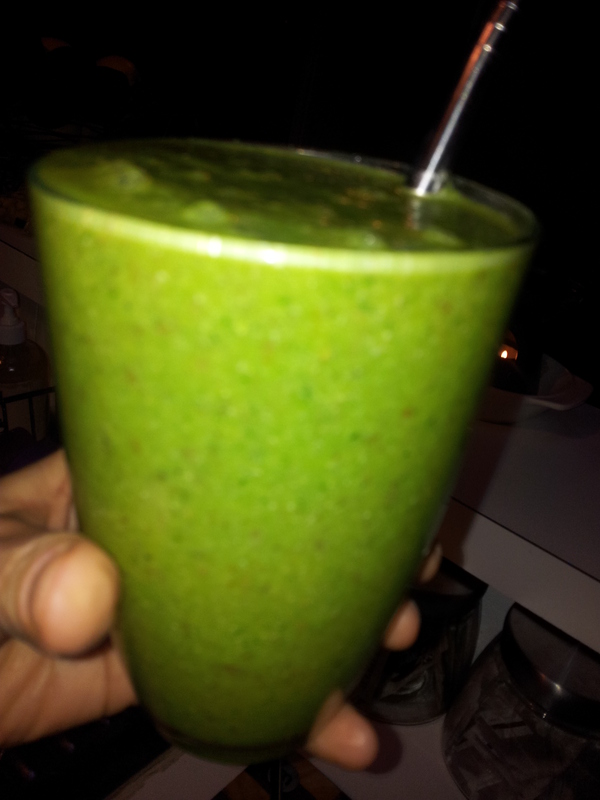 Part of the joy of drinking a green smoothie is that it is green! A green smoothie can quickly turn a not so nice colour if you add certain ingredients to it such as raspberries, blueberries or blackberries. It could go a brown colour and will taste great, but won’t look so appetising. 1. Start by picking your choice of greens. You can have just the one such as cos lettuce, kale, spinach or silverbeet or a mixture. Cos lettuce is so sweet and lovely and l love the smaller green spinach leaves. 2. What liquid are you going to have in your juice? Either plain coconut water or filtered water. 3. Choose the fruit you are going to add. This could be banana, apple, peach, apricot, pear, mango, pineapple, orange and mandarin as examples. Citrus is wonderful as it will help your body absorb the iron from the greens. 4. Add a few interesting things to your smoothie. Limes and lemon’s with the skin on will give the smoothie a kick, while fresh ginger and herbs such as parsley and mint will help to enhance the flavour. 5. 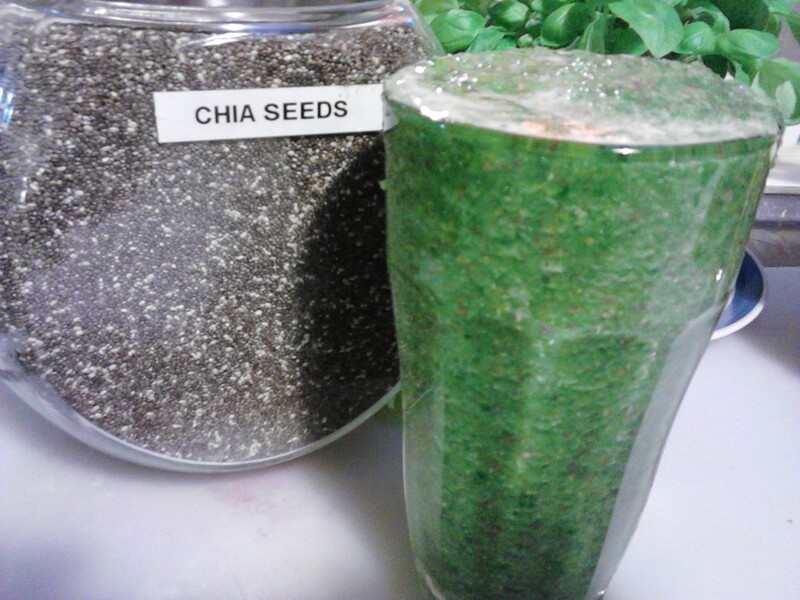 Add additional nutrients such as chia seeds, green powders or nuts. 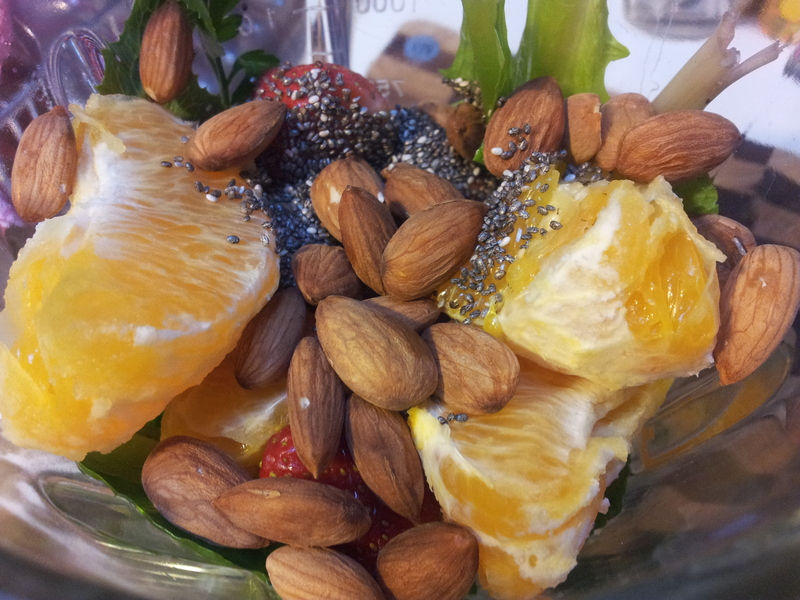 This smoothie has lots of greens, a few strawberries, chia seeds, activated almonds, orange and filtered water. This was such a filling smoothie and there are speckles of red through it from the strawberries. A way to combine a green smoothie with a more colourful ingredients and still have it looking good is to have some fun putting it together as in the one below. Both the green and pink sections tasted wonderful, but when mixed together were a not so nice brown colour. 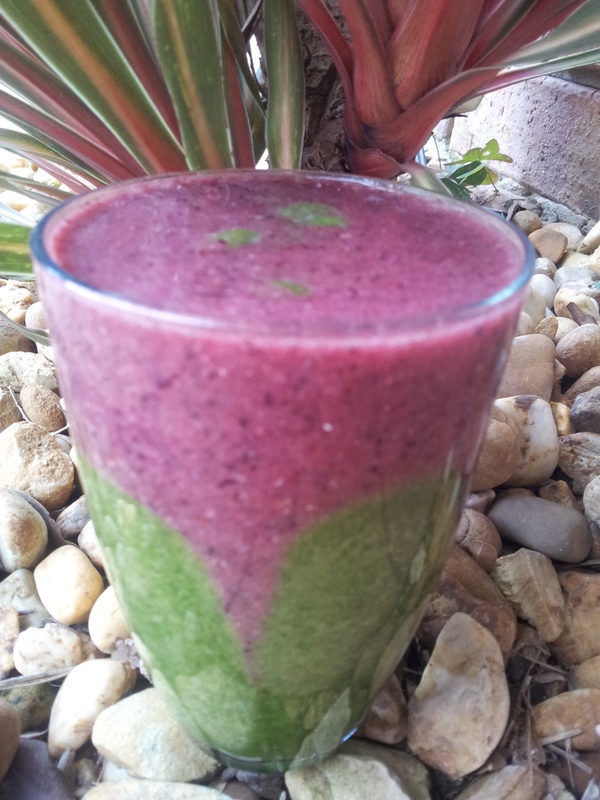 A green smoothie with a dash of colour! The green section is cos lettuce, banana, green apple and coconut water. The pink layer is strawberries, blueberries, acai berry powder, chia seeds, banana and coconut water. I make the green part first and pour it into two glasses and wash the blender, then make the pink part. The decorative pointy bits l do with a stainless steel straw and it looks nice to drink! A smoothie can easily be a meal if you add in good sources of protein such as chia seeds and nuts. I drink them slowly as it is a lot of liquid going into the stomach all at once and adding the nuts and chia seeds make it a bit heavier and thicker as well as slowing down the digestion of the sugars in the drink. Sometimes l have a handful of nuts with the smoothie if it has a lot of fruit in it and this balances out the snack. The best way to get started on your smoothie adventure is to fill up your fridge with lots of healthy fresh food. 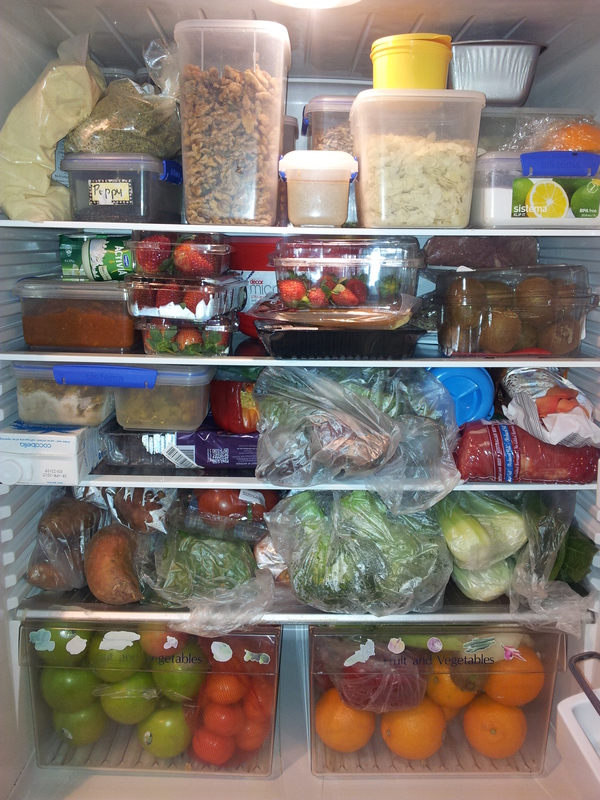 Here is a quick snapshot of my fridge as it looks most of the time. I really need a bigger fridge!